After 40 games of typically mad Belgian football, KRC Genk won the ‘winner take all’ tie against Standard Liege last night to claim their 3rd Pro League title in their history and their first since 2002. The playoffs, as controversial as they are, did manage to throw up a perfect finale to a gruellingly long season. Standard Liege who finished 6th after the regular season of 30 games, hit perfect form at the business end of the season. They came into the game at Cristal Arena with 8 wins from 9 playoff games, whilst Genk had stuttered after a 3-0 beating against Club Brugge. The unique situation regarding the playoffs meant that Genk and Standard went into the game on level points, but Genk were theoretically 0.5 points ahead. When the points were halved, any team on a odd number were rounded up to a full number, so Standard were given an extra half point. Yes, this is the only league in the world (probably) with this formula. This meant that Genk needed only a draw to lift the championship. Standard Liege started the game the brighter, with their five man midfield holding the ball well. Former Wolves player Jelle Van Damme, who has been Standard Liege’s catalyst in the second half of the season, was allowed too much space and hit the bar with a cross. Then the sickening turning point. Nifty winger, Mehdi Carcela was knocked out after a stray boot from Liverpool loanee, Chris Mavinga, and he hit the floor violently. Medical staff immediately rushed onto the field. It was rather similar to the John Terry incident at the League Cup final, in that Carcela’s face felt the full force of Mavinga’s boot. It left the Standard players stunned, notably Mémé Tchité who had to be consoled by a team-mate. Carcela was taken straight to hospital, and diagnosed with a broken nose and fractured jaw. Genk took advantage and went close with two efforts, one of which was a terrible miss by Marvin Ogunjimi. Their star young-gun Kevin De Bruyne, supposedly the target of many clubs, never stopped trying and was the main creative threat for Genk. But then the pendulum swung back to the away side right before the end of the half. A curling free-kick by Steven Defour, hit Mavinga on the leg and Eli Mangala got the final touch, sending the away end into raptures. The perfect time to score as well, 2 minutes into injury time. The second half began as expected with a Genk onslaught. They controlled the game looking for that vital equaliser. Standard keeper Sinan Bolat was in fine form though; first stopping Ogunjimi then tipping a De Bruyne free kick around the post. Vercauteren then rolled the dice with an attacking substitution, taking off masked captain David Hubert and replacing him with Nigerian Kennedy Nwanganga, who had been on the fringes after signing this year. He’s certainly written his name into Genk folklore now though, with a fantastic header 2 minutes after coming on. The Cristal Arena erupted and the tide turned once again. The Standard fightback ensued, searching frantically for a goal. But Genk can thank their 19 year-old keeper Thibaut Courtois for producing three excellent saves, two of which from close range. He’s been sensational this year, playing every minute of a title-winning campaign. There have been rumours that Manchester United has scouted him, and I hope they were watching this performance – tremendous composure for a teenage goalkeeper. Genk held out and the Genk fans invaded the pitch before the trophy was lifted. Manager Franky Vercauteren ran onto the pitch fist clenched to celebrate with his players. He left Anderlecht in 2007 after poor results and a forgettable spell as national team coach, ‘The Little Prince’ has exorcised the demons of the past with this campaign. His policy of integrating youth players with a solid core at the back has paid dividends and many would agree that Genk deserve their title this season. As for Standard Liege, they should be commended for a tremendous comeback in 2011, but it looks like the end of Dominque D’Onofrio’s tenure as manager. At times it seemed that Sérgio Conceição was the one doing the motivating from the bench. It would have been tremendously ironic that the team most opposed to the league format would lift the trophy at the end but it wasn’t to be. It will be interesting to see whether they can hold on to their two prized assets in Defour and Witsel during the summer. Likewise, scouts seem to swarming around the Cristal Arena too, with Genk’s stock rising. It was quite fitting that they wore shirts with ‘Mine for Talent’ on them. Both clubs will be in the Champions League qualifying round, and if Genk keep their spine of their team, they could upset some European giants. That being said, they will be in the Champions side of the 3rd round so could face Rangers or Copenhagen for example. Standard Liege will be in the unseeded side and could face FC Twente, which would see Michel Preud’homme return to the club that he made his name at. Just merely draw speculation at the moment of course. But what a season in Belgium – coincidently the first I’ve had the pleasure of watching. I’ve seen a player throw a duck off the field and recieve death threats. I’ve had trouble getting my head around 3 sets of playoffs. I’ve seen Charleroi sack umpteen number of managers and Wesley Sonck score an overhead kick in the snow. It’s been an experience, one which you can now follow on the Belgian Waffle – once I’ve sorted out a good logo. Watch this space. Finally, congratulations to Genk fans. Deserved champions. Well it’s time for that obligatory Premier League Preview. However due to lack of time and the fact that several esteemed journalists (and some not at all esteemed) have previewed the league, I feel it’s best to highlight 6 players who have all the tools needed to be proficient and efficient in the Premier League. It’s been a strange transfer window really. Very quiet bar the big spenders Manchester City and also a case of ‘chase the hottest prospect around Europe’ game (Loic Remy, Mesut Ozil) in which several managers have participated in and ultimately coming up with no signing. I’ve imposed certain rulings here. Firstly I cannot go with obvious suggestions that media darling pundits have, so this means Javier Hernandez will not be selected due to the fact the world and his dog know he will be good this year and if you’re a eagle-eyed World Cup viewer, you’ll know exactly what he will bring to Manchester United. This also means no David Silva, Jack Wilshere, Gareth Bale, Joe Hart et al. I’ll be honest I was worried about Wigan at the beginning of this transfer window. Several players have left the club after their contracts expired, such as Mario Melchiot (who was beginning to become a liability anyway) and Paul Scharner. Other key players had jumped ship too, like Titus Bramble joining his former manager Steve Bruce at Sunderland. Martinez had a massive summer scouting mission ahead of him. Fortunately, he’s managed to make some great signings. Antolin Alcaraz from Club Bruges, was instrumental in Paraguay’s World Cup success, forged upon a tightly knit defence. Ronnie Stam has signed from FC Twente, who’s continually improved there as a right-back and got a Holland call-up too. But one thing that Wigan have always lacked at this level is an out and out frontman, who’s capable of consistently performing. Step forward Mauro Boselli. Signed from Estudiantes for an estimated £6.5million, he swaps the bustling streets of Buenos Aires for a wet and windy Wigan. He’d managed to build quite a reputation for himself in Argentina, scoring 32 goals in 57 appearances for Estudiantes. He’s an intelligent striker, who knows exactly where to be at the right time. Martinez describes him as ‘a goalscorer, who lives to put the ball in the back of the net’ and if he links up well with Hugo Rodallega or Jordi Gomez, I feel we might see a barrage of goals at Wigan this year. Why Terry Venables thinks they’ll be 19th I don’t know, when Martinez has added some quality to a pretty ropey side. Boselli has even made a Argentinian call-up. You may see this as Diego Maradona experimenting, after all he’s used about 50 players in the last 2 years, but you have to some sort of quality to challenge that front-line. He could flop like so many South Americans before him in this league, but I feel the top scorer in the Copa Libertadores in 2009 might just be this season’s best purchase, and will warrant a big move the year after. EDIT – 23/9/10 – After seeing Mauro Boselli, live in the flesh, discount any information you see here. He looked sluggish against Preston. 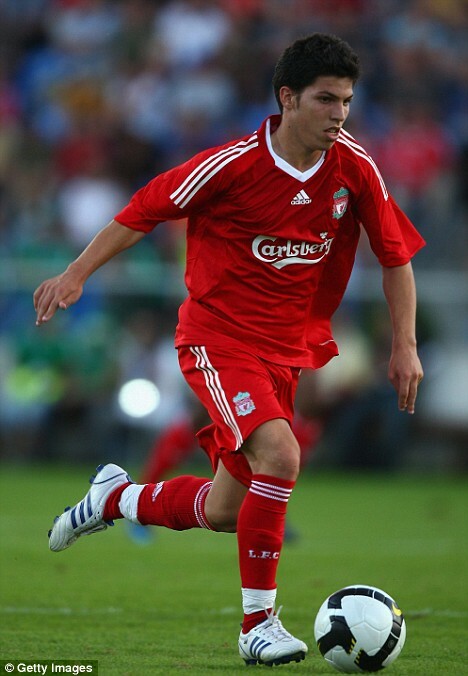 Sean St Ledger kept him in his pocket the entire night pretty much. Don’t listen to me, I have sinned. Ok, I’ve broken the Top Four amnesty. But I don’t think many people realise the quality of this young English centre-forward. This decision was mainly down to his performance in last week’s Community Shield, where came on 2nd half replacing Nicolas Anelka. I feel this might happen a lot this year, since I think Anelka is under serious threat of finding himself at another club. He’s hardly had a good summer either, and I think his time at a top level is coming to an end. This is why I feel Daniel Sturridge is an ideal replacement. He has power and pace in abundance and Carlo Ancelotti found opportunity to play him a lot in the later months of last season, particularly in Chelsea’s FA Cup winning side. He ended up with 4 goals in the FA Cup and finished as the leading scorer for Chelsea. If Carlo Ancelotti integrates him more this season, we may well see Sturridge challenge for national selection. The future’s bright for this young man I reckon. If you were to ask me last season where City needed strengthening, the answer is obvious. The back four last year began superbly but then collapsed as the season progressed. For all your attacking options, you need players capable of offering protection to a solid goalkeeper. Roberto Mancini has acted this summer and brought in German international Jerome Boateng from Hamburg. Of course £11 million isn’t cheap but compared to the £24million City paid for Joleon Lescott, it looks a bargain. Boateng is a strong and versatile defender, capable of playing really anywhere across the defence. He’ll thrive in this league, as he’s renowned for last-ditch defending. He was unsung really in Germany’s World Cup exploits, the plaudits of a free-flowing attack were well noted but it was underpinned by a strong defence. City should be improved this season as I think their major weakness has been sorted out to some extent. He’s often been touted as the next best thing at Liverpool, but former manager Rafa Benitez never really used him or got the best out of him when he did. I think under Roy Hodsgon we may see that change. Pacheco was instrumental along with Sergio Canales in the Spanish side that were runners-up in this year’s U19’s European Championship in France. What Dani lacks in height, he makes up double in creativity and all-round trickiness, a general requirement of any Barcelona youth player. If given the chance this season under Hodgson, he could link up well with a fully fit Fernando Torres (will this ever happen?) and we should see more of the man nicknamed The Assassin by team-mates due to his ability to score from anywhere. 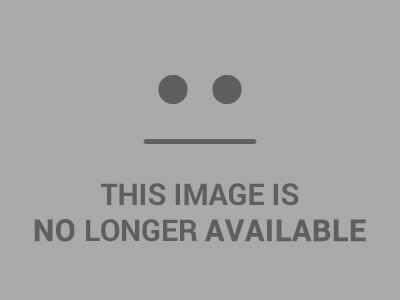 I feel it’s only fair to highlight someone from the promoted teams, and while Charlie Adam seems a good pick, I’ve decided to go with the Baggies playmaker. He was unbelievable last season in the Championship, and certainly worthy of his place in the Team of the Year. He’s the linchpin of the side, and his partnership with Chris Brunt was key to West Brom’s promotion last year. He’s an all-round central midfielder with a sweet shot on him too. I still think West Brom are relegation candidates, after all the club is a yo-yo side, but if they want to avoid the drop look no further to their young midfield driving force. All they need a good striker and they may have a chance to get mid-table. Even if West Brom go down, I get the feeling he won’t find it hard to garner some Premier League interest. Scotland, there is something to get excited about from a upcoming star. Another player to shine in Javier Aguirre’s exciting Mexican side, this winger could prove a real handful for some Premier League teams. The thing I remember most about Barrera at the World Cup was the torrid time he gave Eric Abidal in the France game (arguably Mexico’s best performance at the World Cup). He looks nippy and a decent crosser too, something that West Ham will need to feed Carlton Cole up top, or maybe Frank Nouble if he’s given a chance. The 23 year old moved from Mexican side Pumas for £4 million. I’m not totally convinced about West Ham’s plans under Avram Grant but I think Barrera could be a hugely influential midfielder for them. So there we have it. Let’s see next May how badly wrong I was. Rather begrudgingly, I have to admit City have got their shirt spot on once again this year. They have changed their kit maker to Umbro, which seems to be a good move. Once again the phrase simplicity crops up Sky blue, white arm trim. Done. Very similar to England’s away kit with the fabric and look used.Also like the nice touch inside of the collar, of the classic City scarf. I think that was Mancini’s idea, he just loves striped scarves that fella. After last year’s shirt show-stealing performance for all the wrong reasons. Newcastle opt for a more conservative option this time round in their return to the top flight. The Championship winners of course have their black and white striped shirts, but it’s a pretty rubbish shirt. Puma have gone for some weird fabric that doesn’t look high quality, plus they’ve kept with the unorthodox collar (I like it but many don’t). The back is all white, which goes against the Geordie grain. Also don’t really like the black shoulder design. There’s too much black there and it’s very reminiscent of the kit they wore to relegation. The away shirt is a peculiar shade of blue and to be honest I prefer the 3rd kit to it. Newcastle are once again sponsored by Northern Rock. Oh dear. Stoke’s new agreement with Adidas couldn’t have produced a more unsatisfying shirt. It looks like a patchwork quilt. Too many ideas are meshed together to create a monstrosity. Harsh? The red and white stripes are accompanied by dashes in between. Why, I do not know. The neck/collar area looks strange and again Adidas have had to put a space for a Premier League badge. Speaking of badges, the Adidas one on the left is weirdly places. Yes, it is safe to say I hate this kit. The away kit arrives on the 2nd August, I’m hoping for something better. Stoke continue their sponsorship with Britannia for this season. Umbro make it a three peat of superb kits. As you can tell by the promo shot of Darren Bent with a ancient football, Umbro have gone for the classic look. The new sponsor, bingo website Tombola is put onto the shirt, without it looking out place. Interwoven if you will. The red and white stripes are complemented by a good red collar look. The away kit as you can see is all white with a subtle hint of burgundy. I really like this kit as well. Fantastic effort. Puma have gone a bit crazy with the Spurs shirt. Once again, don’t understand the decsion to move the Puma badge up to the shoulder on the home kit. The diagonal navy blue strip across the top of the shirt would be fine apart from the white stripes added along it. It just looks a bit off to me. The change strip is now sky blue. It’s been a while since it has and I think it’s a move for the better. Well we finally have one Umbro kit I don’t like. The Baggies have bounced back to the Premier League for the umpteenth time and brought a polostyle home shirt with them. I don’t like polo shirt in general so I may be biased here, but the contrast between that and the sponsor Homeserve offsets the vintage look Umbro went for. Shame really. The away kit however is a lot better. Subtle black stripes are simple and effective. Only downside for me as a traditionalist is West Brom not having green and yellow in their away kit. It was unavoidable. This promotional picture had to be used. Mark Noble and Thomas Hitzlsperger eating a full English down a East Lahndan caff. Not fulfilling any Cockney stereotypes there then are we, West Ham PR department. The kit itself is unique in a way. The claret and blue hoops around the middle of the shirt seem to be in honour of Sampdoria possibly. Then again maybe not. Overall, not a bad away kit although slightly tarnished by Macron’s logo on the sleeve. And of course away days are very much like this. Hash browns and bacon at a service station in your change strip. The wait was worth it I guess. 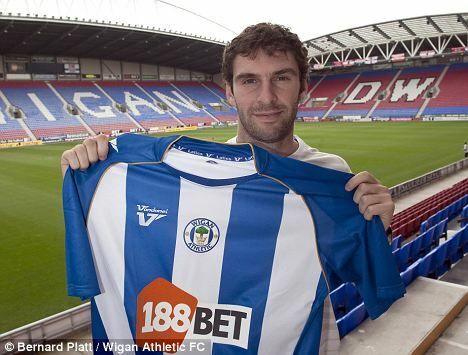 Wigan are sponsored by 188Bet again for 10/11. They are Premier League but not in the shirt stakes. Burrda have poorly imitated Umbro in the traditionalist approach but this could well be Mick McCarthy’s desire to hark back to the Molineux of old. Muddy pitches and parasite football as Mick moaned all summer long. Anyway, the shirt is not too bad until you realise that the retro idea is ruined by the Sportingbet sponsor. Alternatively buy the kids shirt since it won’t have. Although this might arouse suspicion. The away kit is the reverse sans the silly collar. With the World Cup well and truly buried (as well as Emile Heskey’s international career), it’s time to look forward to the new season. And obviously the first way to gauge how your team’s going to do is via the kit they’ve chosen to wear for 9 months. So allow me to become the footballing equivalent of Karl Lagerfeld and guide you through what your team is sporting for the coming season. The home kit is very simple but works so well. Not convinced on the goalkeeper’s shirt, with the crazy lightning-like stripes on the sleeves. The away kit has returned to yellow, which is the colour Arsenal away kits should be. The ‘redcurrant’ pays homage to the Woolwich Arsenal days, like the home kit from 05/06 from the last Highbury season. Solid effort but I sort of get a Gryffindor vibe off the away kit. May as well tie in a film deal. Arsenal are of course still sponsored by Fly Emirates. Aston Villa’s claret and blue remains but there’s some changes from last year. Firstly, new sponsor in FxPro(Fulham share the same sponsor). Also for some bizarre reason, Villa/Nike have chosen to have a chequered design down the side. Don’t particularly understand why unless they fancy adding several Croatians to the side to make it valid. No blue outline around the collar this time. Finally, we have an abombination of a kit. I haven’t even edited this picture from the website. The kit looks like it’s in a heavenly place but it belongs in ‘Football Shirt Hell’. Or a bargain bin. Bolton are again sponsored by 188BET (along with Wigan) and where do I start here? Firstly the red piping is just weird and all over the place. Next we have the sort of navy undone cravat shape around the collar. Don’t know why that’s there. Finally along the shoulders we have a massive Reebok logo. Just in case you didn’t know that Bolton are associated with Reebok. Chavs will love it. I hate it, a horrible mish mash of ideas that could have been done so much better. An away kit has yet to be released, but I fear for the worst. The champions kit has been out for a while now. In fact they wore it in the FA Cup Final. So this home kit has a perfect record. But it’s anything from perfect. The red collar is a bit strange, although I approve of the V-neck shape itself. I also think the badge and sponsors are a bit too close together really. Otherwise the usual Adidas kit design is there. The away kit I like. Orange and black are a good combo (yeah because I’m a football fashionista. However it looks like a Wolves away kit to me, not a Chelsea one. I suppose that happens when you chuck out loads of colours each year. Not a big fan of the orange stripe bit towards the bottom (technical terms there). Still it’s better than looking like a steward. Overall average. Chelsea are sponsored by Samsung. Oh Everton. Why do you let yourself be sponsored by LeCoq Sportif. I’ve seen them make one good kit in their history (a French national kit I cannot find). But wow. Home kit doesn’t really need discussion here. It’s fairly standard and simple and I’m glad they’ve got rid of the Dairylea triangle bib from last year’s kit. But my god is the away kit bad. Last year’s wasn’t good either, although I liked the concept of black and neon pink. The execution was lacking though, and this year’s designer deserves some sort of metaphorical execution. Pink kits work if you go for a pastel pink (like Palermo) but bright neon is a no no. Don’t even like the dark blue splodge across it either. And guess what we’ll see this shirt at least 5 times. Hoorah for chavtastic kits. Everton are sponsored by Chang Beer once again. Roy Hodgson has gone and so has big sponsor Nike. Kappa now produce the kit and it’s not a bad effort. 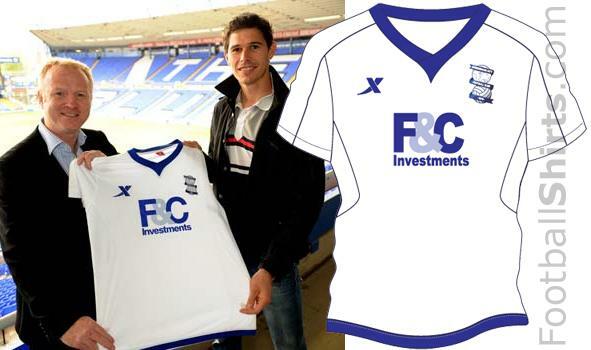 Again simplicity works well, although the kit is slightly ruined by the decision to put the sponsor way up the shirt. Otherwise a good effort. Away shirt yet to be revealed, although I’d expect a red/black shirt. Arguably the biggest talking point is saved til last. Liverpool without Carlsberg as a sponsor. I never thought I’d see the day but as Carlsberg say ‘If Carlsberg made a football team’, it wouldn’t be the state Liverpool is currently in. Standard Chartered take up the mantle as club sponsor. The home shirt is of course blood red, but with some strange decisions, mainly the gap in the Adidas stripes. I like the use of the triangle pattern, that works quite well. The away kit I dislike purely on the basis of the vastly spread apart pin-stripes. Why are they there? The third kit, again part of the Adidas neon piping range, would be good without one major flaw. The neon club badge. Ghastly. But weirdly enough, this is one of Liverpool’s best shirt designs in recent years because they usually get it very wrong. Like grey, who wears grey. Damn it. You were so close Liverpool until you gave Pepe Reina a shade of grey to wear. So there are the first 10 clubs. Join me soon to look at the Manchester club kits and hopefully no Newcastle away kit in sight. All kits are available in club shops and all good sportswear stores and sites. My preference – Kitbag. Stijn Stijnen – the man behind the posts? Contains Scenes Of Mild Peril.